I believe that everyone can make something beautiful. I believe that you can make something beautiful. This full colour 18 page Guide to Rug Hooking will do just that. It will teach how to hook rug. It will inspire you to create beauty everyday. Subscribe to my newsletter in the box on the sidebar and we’ll email it to you. Did you check your junk mail? If not email rugstudio@eastlink.ca and we will send it to you. I subscribed a few days ago but have yet to receive guide! I’m on your list…but now I don’t remember if I got this. Better check my spam folder. Could you resend it? Oops! Window/message still open and thought I had failed to send! Not trying to be repetitive ;-)! Deanne; Am doing major ‘catch up’ just per blog here and realize that I missed this download – among so many other things as well/sigh. Hoping you can ‘resend’ – and that I can access. Thanks Deanne; for any/all help, per your ‘Guide’. Am doing major ‘catch up’ just per blog here and realize that I missed this download – among so many other things as well/sigh. Hoping you can ‘resend’ – and that I can access. Thank you for the free guide…a generous lady indeed! Great guide, Deanne! Packed with information and so inspiring! A few people have this problem. MOst though have been able to download it.If you email me directly, I will mail it to you. Hi Deanne, I already subscribe to your newsletter – and love your rugs. But when I click on the link to download the pdf the page just comes up blank?? And I was so looking forward to reading your guide. I received the email with the link to the Guide; however, the link doesn’t work. Is it me or has anyone else had this problem? I will mail the guide out to everyone this morning. So is the Guide available only to new subscribers or should I be able to access it since I am already “embedded”? Hi, I just love your beautiful work. I subscribed and was sent your guide but my email just won’t open your attachment. I’ve no idea why – I would love to read it and admire the work therein. Is there another way I could get it please? I find your work both moving and inspirational. Hello… I’m hanging around your online site unable to get my fill of the lovely things I see here — and since I’m waiting for my kit to arrive and have nothing as yet to get my hands on… I’m practicing patience. Can’t wait to hear more about the planned online workshops. I’ve signed up for the one in September, but that seems such a long ways off! Well, I’ll sign off now, but will probably be back VERY SOON. Deanne, your work is startlingly beautiful! The textures, colours and motifs are truly breathtaking. 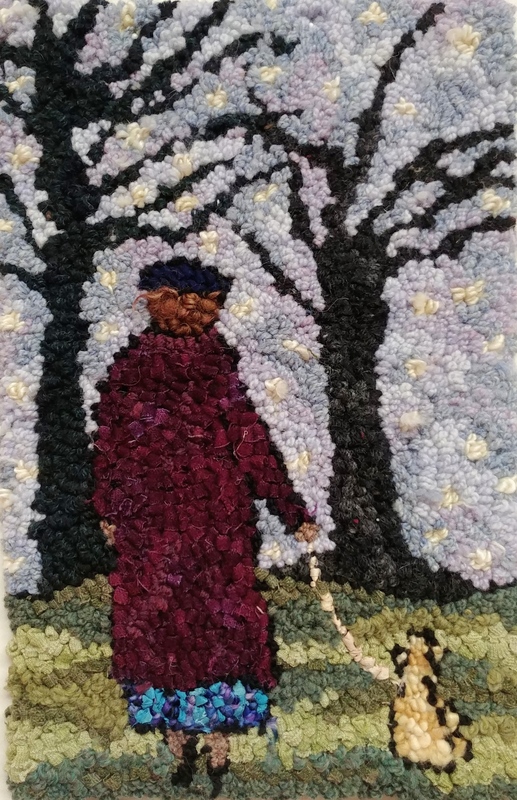 I had no idea rug hooking could be so vivid in imagination — rendered as true art work. I rug hooked as a child and loved it … deciding to look on the internet to see if there were rug hooking supplies, kits, etc. to take up as a hobby now that I am retired and stumbled upon your site. I eagerly await your Guide to Rug Hooking and honestly cannot imagine thinking of rug hooking the same way again. Love it!! Cant wait to receive it and share with some friends who are interested in starting. You have certainly played it forward 🙂 Thanks so much. I’m excited to get your Guide – but after I fill in my email & name, the subscribe button won’t click – I did it twice – so either I’m subscribed twice or not at all! Arrgh…computers! Belated Happy Mothers Day ….. Looking forward to receiving the rug hooking hooking guide . Thank you so much ! Hi Deanne, I’m already signed up for the newsletter. Would I need to sign up again? Looking forqard to receiving the New Guide to Rug Hooking. You are awesome Deanne and continue to inspire me! I’m sure there are some great tips and helpful hints in the new Guide. Happy to hear that your Mother’s Day was great! I am so inspired to create whenever I visit. The words and images and sentiments expressed make me smile and I get fidgety to go work on my some simple and some grandiose projects. You elevate this beautiful craft into such a glorious level art that it becomes magic and then to top that, you make it possible for others to join into your world. You have fed my soul with your engaging site and I wish you and yours great joy. You are a breath a of fresh air Deanne! Great to hear about the Guide being sent out. I’m hoping it will tell us how to back other items other than rugs. I’m wondering how to backfinish coasters done on burlap with wool.I very much enjoy your daily blogs.what energ you have!! wow….that is great. Looking forward to recieving thsat guide. I have just started hooking, finished a teddy bear and am working on a small matt…I LOVE IT!! yup I am hooked!! lol…I am getting ready to put an order in today or tomorrow from your shop..I am very excited to get started with a new project…thanks again. thanks Julia, please feel free to share it with any students. Happy Mother’s Day to you Deanne. I hope that you’re having a wonderful day today. Thanks for the offer of New Free Guide to Rug Hooking. I’m looking forward to receiving one in an email.